Batman is the story of the adventures of a double character; one as batman the superhero and the other as the neurotic millionaire Bruce Wayne. 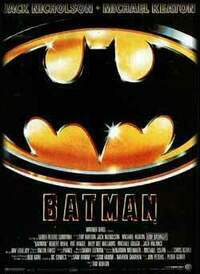 Batman must stop The Joker, played by Jack Nicholson, who’s causing terror to the people of Gotham City. The film was extremely successful at the box-office after a smart merchandising campaign.